Uriah Thomas Applin was born May 8, 1820 in Vermont. He was my great-great-great grandfather. Not much is known of his family. All I know is that his mother was Rebecca Capron, according to Civil War records for the Town of Carlton. His father is still unknown to me, although there is much supposition as to his paternal heritage. None of it is verified. It’s a brick wall that I hope to one day break down. 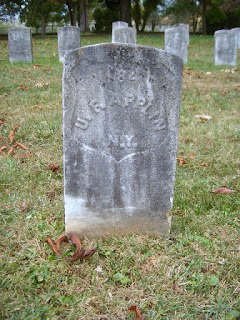 In the meantime, who was Uriah T. Applin? He married Sophia Chapin, daughter of Abner Chapin and Rebecca Foster. They were married in the Town of Gaines, Orleans County, on September 30, 1842 by the Methodist minister, Earl Fuller at the Fairfield home. They had several children, including, Lucy, my great-great grandmother, in December 1854. When the Civil War broke out, there were many men who volunteered for service in Niagara and Orleans County. Uriah was no different, despite being 42 years old when he volunteered. According to pension papers in Washington, DC, Uriah enrolled in Company D of the 151st NY Infantry on August 27, 1862 in Barre. Those men who had enlisted we sent to Camp Church in Lockport for training on September 9th. Camp Church was located on the site of the original Niagara County Fairgrounds, which was situated at the northeast corner of Washburn and Willow Streets, just south of Grant Street. There was more than one training camp in Lockport; indeed there was even more than one camp at the fairgrounds. 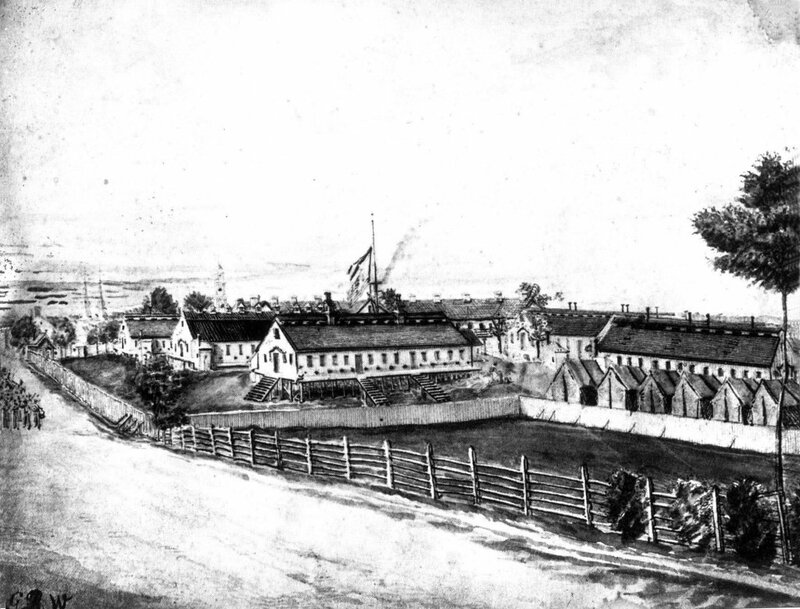 Camp Niagara was on part of the grounds, and housed the 28th Infantry in 1861. There was also Camp Riley in the northwestern corner of the City, at the edge of the escarpment. After arriving in Lockport on the 9th, the regiment went right to work training the new recruits. A reporter from the Lockport Daily Journal & Courier visited the camp on September 14th when there were 600 men in camp. He noted that most of the men had received their uniforms and it was looking less like a campsite and more like a military establishment. There was no shortage of issues, as is common whenever that many people are confined in close proximity for any period of time. The guard house on the 26th was “pretty well filled for various indiscretions,” including one boy leaning across the line to kiss a girl. The regiment held a dress parade October 3rd, with the looming specter of departure to the war over the camp. The 151st was issued orders to prepare to leave Lockport October 15th. As Wednesday rolled around, inclement weather delayed the orders until Saturday, October 18th. While waiting, Chaplain Elias M. Buck was preparing marriage certificates for some of the volunteers before they left for war. It seems that it is a common practice before all boys leave for all battles in any time period. However, their departure was delayed once again with new orders on October 17th. Finally, the regiment was on the move to Baltimore, Maryland. On October 23rd, 1,200 soldiers moved out from Camp Church, heading for Elmira before making their way to Baltimore. The train left Lockport at 4:30 amid a crowd of families and well wishers. The regiment was expected to join General Emory upon arrival, and once the division was formed, they would head to either Florida or New Orleans. The troops arrived in Baltimore at 10pm on the 26th. The following morning, they were woefully unprepared for review, and Emory refused to allow them into the division. The 151st was “reassigned to the Eighth Corps, part of the Middle Department of the Union Army.” They made Lafayette Square Barracks their winter home. When the troops were mustered in before leaving Camp Church, each man, including Uriah, swore the following oath: I do hereby acknowledge to have volunteered this 22nd day of October, 1862, to serve as a soldier in the Army of the United States of America, for the period of three years, unless sooner discharged by proper authority; do agree to accept such bounty, pay, rations, and clothing, as are, or may be, established by law for volunteers. And I, Uriah Applin, do solemnly swear, that I will bear true faith and allegiance to the United States of America, and that I will serve them honestly and faithfully against all their enemies or opposers whomsoever; and that I will observe and obey the orders of the President of the United States, and the orders of the officers appointed over me, according to the Rules and Articles of War. One of the first duties of the regiment was guard duty at local hospitals, with each of the companies rotating in and out. A typical day for the regiment was Reveille at 5:30am, with breakfast at 6am. Sick call was at 8am, followed by company drill at 8:30. Lunch was at noon. Officers drilled at 1:30 with the battalion drilling at 3pm. Supper was at 6pm, and Taps was played at 9pm. The 151st received their first real orders on February 14, 1863 when they were assigned to the Third Separate Brigade to protect the B&O Railroad between Baltimore and Monocacy and Frederick, and also between Baltimore and Annapolis. April 26, 1863, the regiment was given combat orders to proceed to Monocacy Bridge with the 14th New Jersey Volunteer Infantry. They arrived at noon, without their tents and gear. Early the next morning, the regiment was pulled from Monocacy towards Harpers Ferry to Maryland Heights. Members from Company A were sent for picket duty eight miles away near Antietam. The regiment sent most of the next month moving throughout the valley, without tents and wrapped only in blankets for the nights. Ten of the twenty-five nights they were camped out in this manner, it rained. Between this and poorly cooked meals, disease was rampant throughout the regiment. On May 23rd, the regiment was ordered to Martinsburg, West Virginia, arriving on the 27th. After marching for two days, they boarded a train for the last day of travel, getting “the best night of sleep since we left Baltimore.” The first of the month they were sent to Point of Rocks to put down a rebellion with their own army. 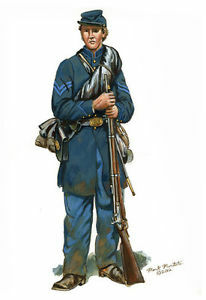 The 5th Maryland Infantry had refused orders to march. Applin’s Company D was one of the companies engaged to quell the mutiny. The regiment was sent back to Maryland Heights on the 15th. General Lee’s army was closing in. The soldiers from the 151st slept with their weapons at the ready each evening. Nerves were high. At one point, a member of Company A captured a group of rebels, that eventually were determined to be fellow members of the 151st, from Company B. On the 29th it was reported that Lee was moving northeast towards Pennsylvania. 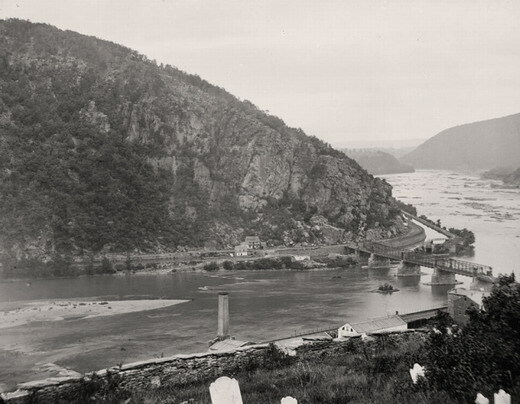 Orders were given for the command to move to Frederick, Maryland in order to block a retreat by Lee to Harpers Ferry. They maintained this position throughout the Battle of Gettysburg. William DeWolf of Company G recalled that during all three days of the battle, “the cannons were firing an almost constant barrage.” After Lee retreated on July 4th, the 151st was sent to find him. In the midst of a thunderstorm, they double-timed on a twenty-one-mile march. With heavy, sodden packs slowing them down, soldiers began discarding excess equipment on the sides of the road. They stumbled into their destination just after dark. When they woke the next morning, they were atop a ridge overlooking Frederick, Maryland. 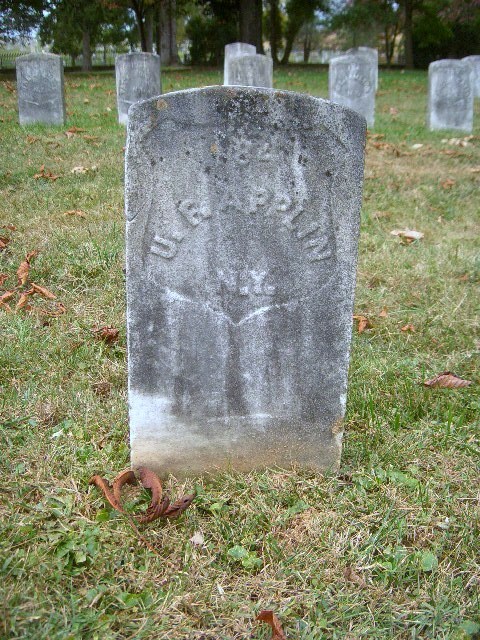 Uriah T. Applin was buried in the Antietam National Cemetery under the name “U.F. Applin.” It is not clear where he was buried right after he died. It was probably close to the hospital and then moved to Antietam when the cemetery was established in 1867. Meanwhile, Sophia was given a pension of $8 per week. She lived until August 1887, and was buried in Kenyonville Cemetery in the Town of Carlton. I have been to Antietam twice, and I stayed in Frederick every Memorial Day weekend for a decade. In that time, I had no idea that I had a direct ancestor buried there. I have been to Maryland Heights, Point of Rocks, and Harpers Ferry. I have walked in the footsteps of my ancestor. Yet, I had no idea at that time. Now, I want to go back and revisit those places. I’ll see it all with new eyes, and a new appreciation of all that he and so many of our ancestors went through. My kids want to go to Washington, DC for a vacation. I’m thinking that it will have to be sooner rather than later. While Uriah may not have seen any action, dying before the regiment actually entered the fray, he still volunteered to help preserve one, united country. He left his home and his darling girl behind, and was buried far away from his family and friends. Stay tuned for some more articles on some of the stories about my ancestors. There are some very interesting stories. I have what will end up being several part series on another great grandfather who served in the Civil War and saw a great deal of action, including the surrender of Robert E. Lee. I also have an in-depth article on Camp Church in Lockport. Since I had family members who trained there, I wanted to know more. Look for that in the next day or so. My research has garnered enough information for a nice article. Craig Bacon thinks family stories are very important to preserve, even if they’re not always steeped in accuracy. There’s still a reason they told those stories.